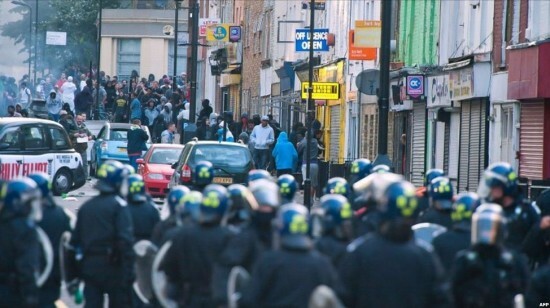 16,000 police officers patrolled the streets on the last night of the riots to protect the UK from the animalistic violence, in the end resulting in more than 1,600 arrests. 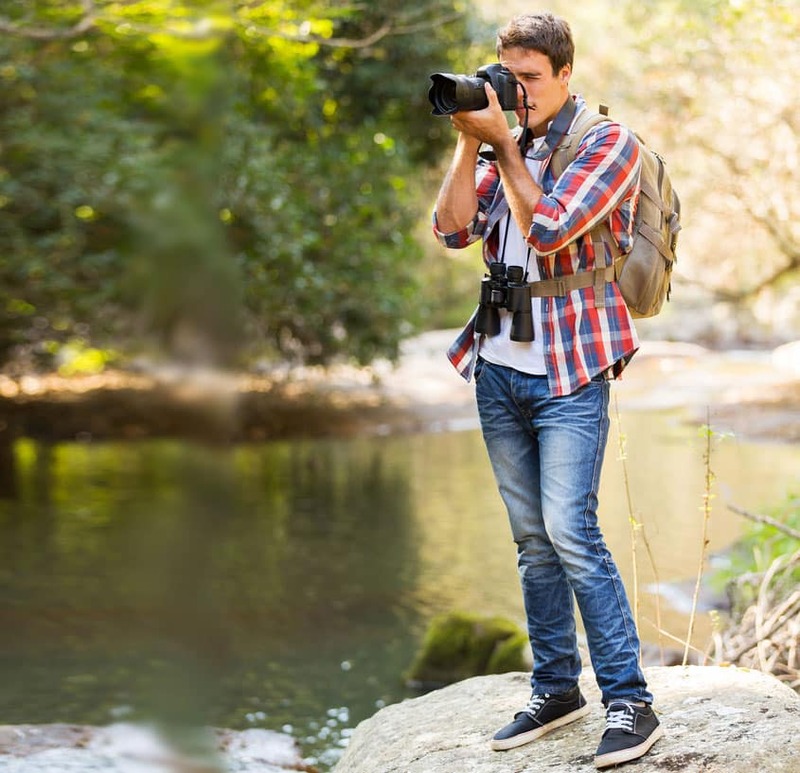 And amidst all of this mindless anarchy were photographers (both professional and amateur) snapping striking images of these acts of thuggish criminality. 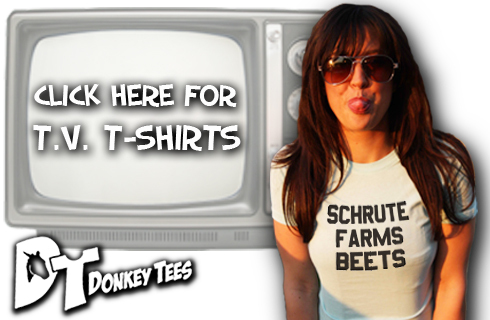 Here are the top 20 most amazing of these images, assembled in no particular order. 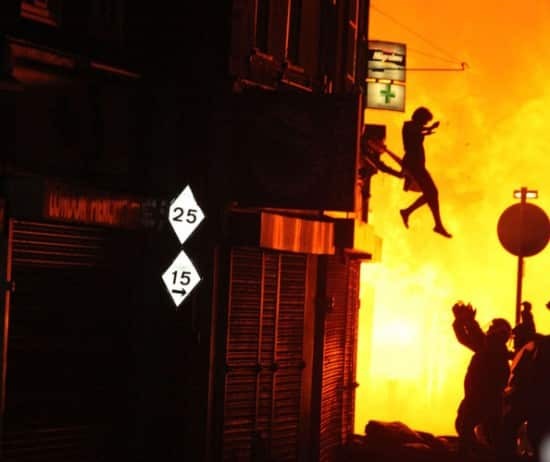 A woman leaps for her life from a burning building into the arms of riot police in Croydon. 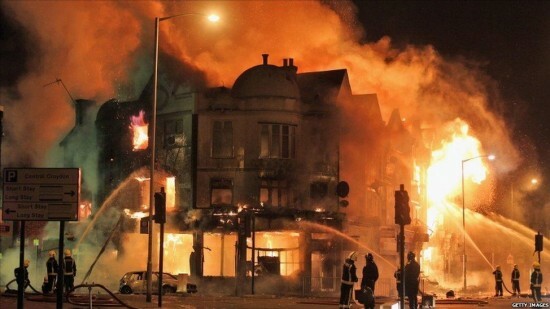 Firefighters attempt to extinguish a building set on fire by arsonist rioters in Central Croydon. 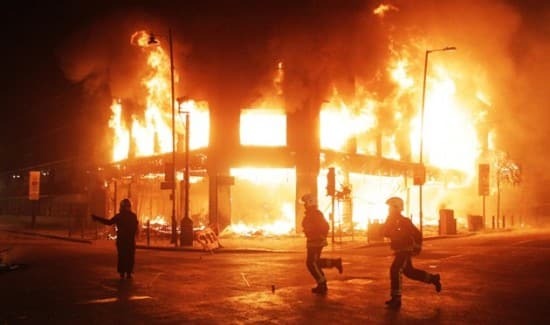 There were an estimated 2,169 calls to the London Fire Brigade, 15 times the regular amount, on the third night of violence. A police officer guides pedestrians away from a blazing car. 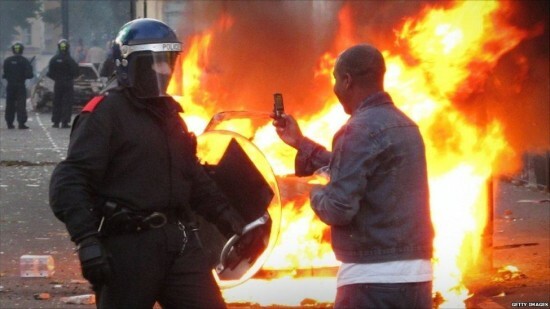 An onlooker films a policeman with his mobile phone in Hackney as a car burns behind them. 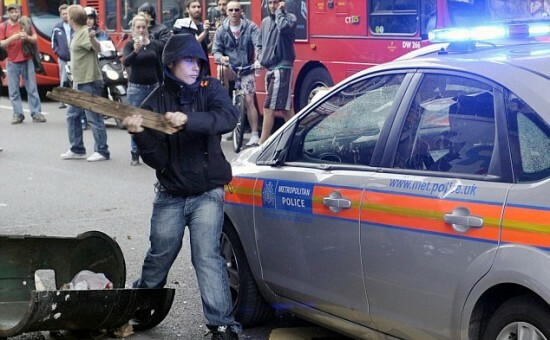 A young rioter beats the side of a police car with a plank of wood. 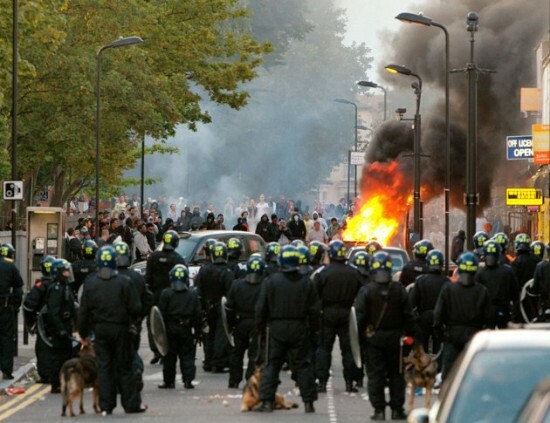 Rioters as young as 11 years old are known to have joined in on the carnage. 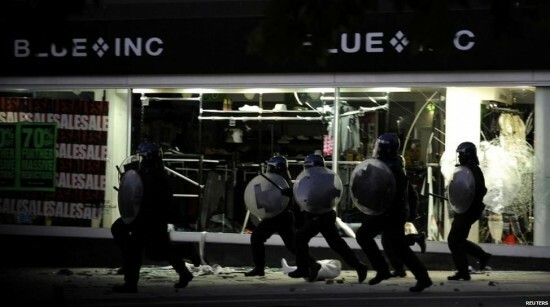 Riot police run toward trouble in front of a Blue Inc store, the windows of which have been smashed. Police officers stand together opposite a crowd of hooded rioters. 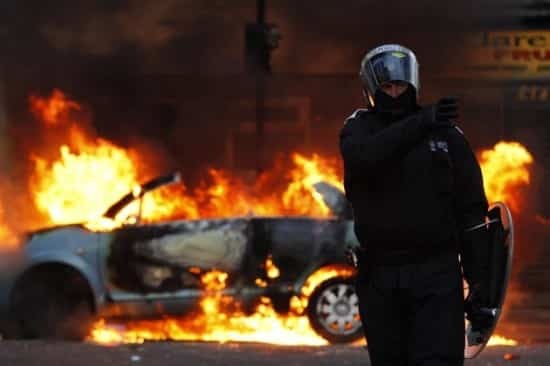 There were complaints by some members of the public that the police did not interfere enough with the rioters‘ actions, resulting in many being allowed to cause whatever chaos they wanted. 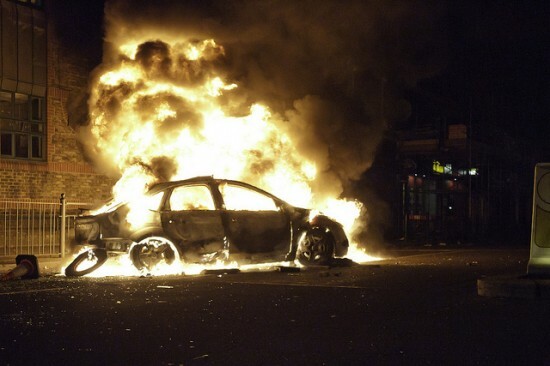 A Tottenham car engulfed in flames, one of many vehicles randomly set alight by thugs. Volunteers pour cups of tea for Camden Town police officers, using a riot shield as a tray. 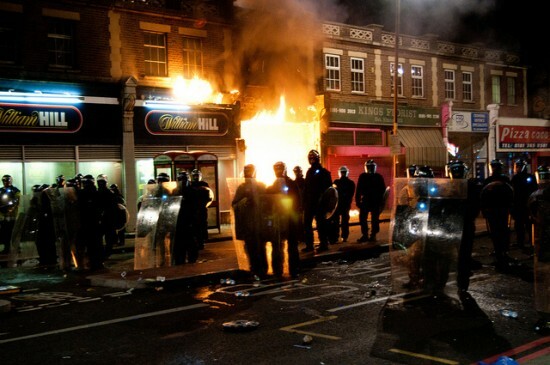 Thousands of volunteers took to the streets armed with brooms in the aftermath of the riots to clean up cities. 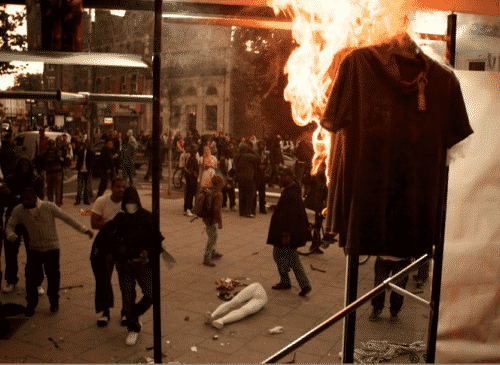 Rioters have set alight a t-shirt in a clothes/sports store, most likely looted by the gangs. 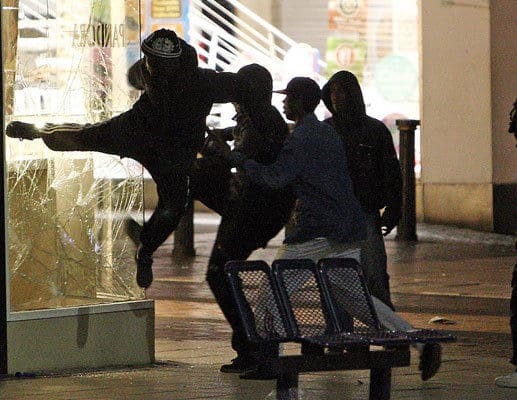 Rioters attempt to smash open the window of a store to rob its products. A masked youth casually strolls across the street as a car violently burns behind him. 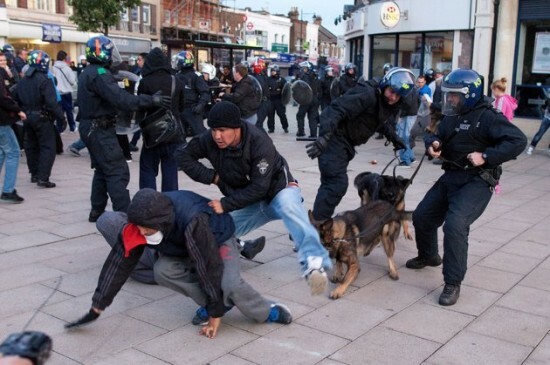 A couple of rioters stumble away from two police officers and a pair of trained police dogs. Firefighters run to extinguish a building that’s been turned into an inferno in North London. 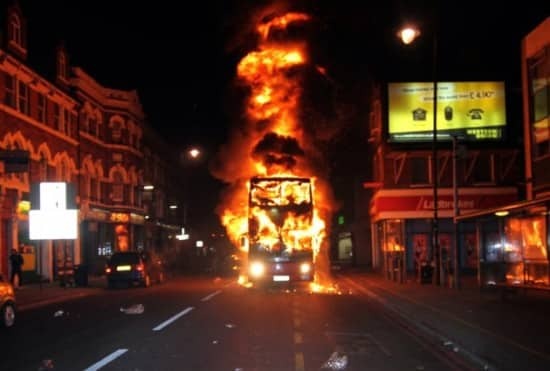 A double-decker bus is completely engulfed in flames in the middle of a street. Riot police stand to protect the city, a fire raging inside a building beside them. Riot police on one side, rioters on the other, flames burning in between them. 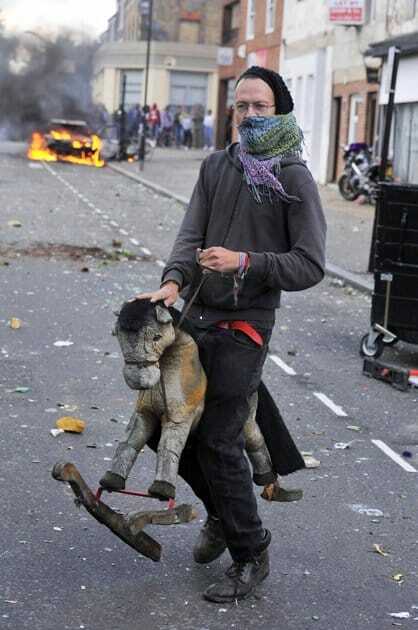 A masked rioter jokefully rides a rocking horse across the street. 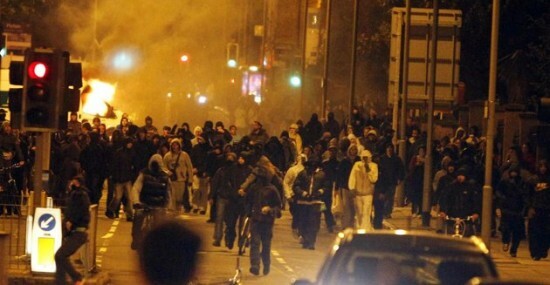 A large gang of hooded youths take to the streets to cause chaos. 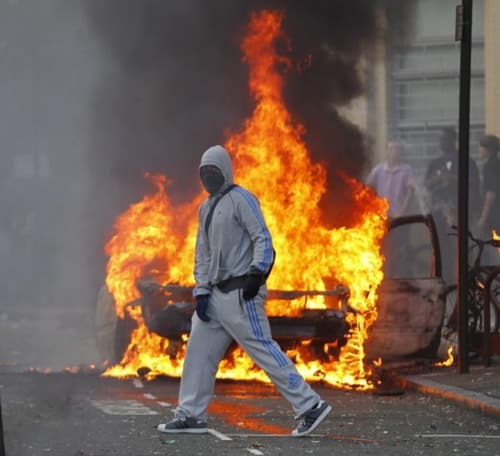 It was generally thought that most of the thugs were opportunist criminals simply trying to steal goods for themselves. 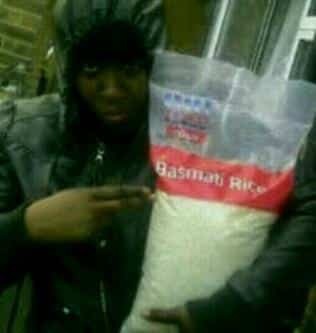 A not-very-ambitious looter steals himself some Basmati rice from a Tesco supermarket.